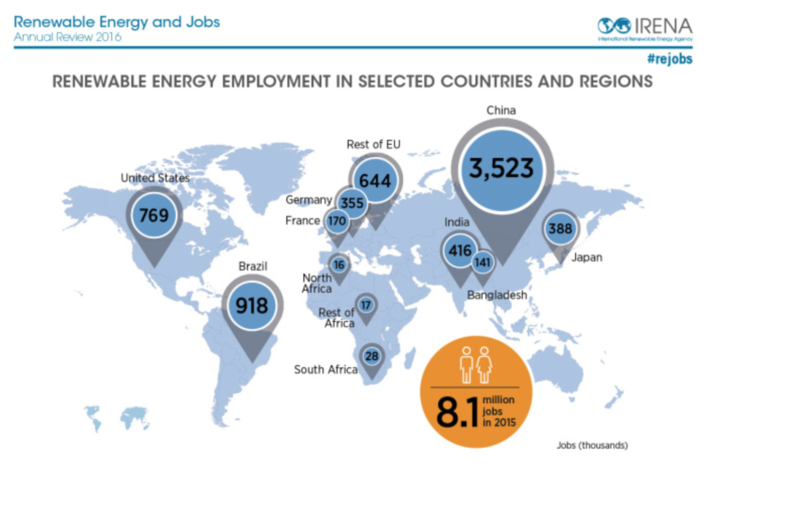 Energy efficiency jobs: Where does Tennessee stand? New findings of a national energy efficiency report reveal energy efficiency is the largest sector within the U.S. clean energy economy. According to the report, this sector accounts for three in four of its jobs and employs nearly 1.9 million people nationwide. The document, entitled “Energy Efficiency Jobs in America,” was released by Environmental Entrepreneurs (E2), E4TheFuture, and BW Research Partnership. The energy efficiency industry helps customers squeeze more productivity and comfort out of the same amount – or less – energy. Its workers install smart lighting, for example, or seal duct leaks in HVAC systems or insulate walls and ceilings. They also make climate control systems run better or manufacture state-of-the-art appliances. In short, they figure out how to help homes and businesses run leaner by lowering utility bills. For the Volunteer State, the report says about 27,500 Tennesseans work in energy efficiency related jobs. The majority of employment is focused on traditional HVAC and renewable and efficiency heating and cooling technologies. There are also a few thousand workers who support Energy Star appliances, efficient lighting, and advanced material and insulation. Most firms are either primarily focused on installation or trade. Installation firms account for 45 percent of establishments and trade firms account for a third. 59 percent of these businesses are small, with fewer than 11 permanent employees each. But Tennessee has representation across medium to large-sized establishments as well. Just over a quarter (27 percent) report 11 to 99 permanent workers, and nine percent note 100 workers or more. 63 percent of firms derive the majority of revenue from this work, with 37 percent noting all of their revenue is attributable to energy efficiency services. Tennessee ranked 25th in the nation in the 2016 State Energy Efficiency Scorecard, moving up six places since the 2015 ranking. The state scored very low in the utilities category because both investments and therefore energy savings are lower than the national average (ACEEE). When it comes to a county-by-county basis, the following counties had the highest recorded energy efficiency employment. 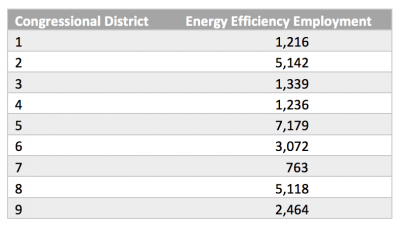 Here is a graph comparing energy efficiency employment to the corresponding congressional districts in numerical order. Next week, the Tennessee Advanced Energy Business Council and the Howard H. Baker Jr. Center for Public Policy will release the Tennessee Advanced Energy Economic Impact Report. The report is the first document of its kind that defines the scope of Tennessee’s advanced energy sector and quantifies its economic impact. It identifies the number of jobs, contribution to state Gross Domestic Product (GDP), state/local taxes and the number of companies associated with Tennessee’s advanced energy sector. Stay tuned for more information about the report, which will be available online on Wednesday, June 17.